I like to stay organized and when I travel I hate when I have to dig through bags and boxes for my jewelry and small items that I pack. This Jaimie Jewelry Organizer is a great way to keep me organized when on the road. It has so many compartments to store my jewelry pieces and other small items like hair clips, prescription medication and things like that. The case is durable and made of a honeycomb material that is easy to clean. It is also strong and tear resistant. This makes a great gift for anyone who travels and likes to stay organized. 💍 PORTABLE DESIGN (Travel Ready) - Jaimie Jewelry Organizer's portable design is ideal for both The Home & Your Weekend Getaway. 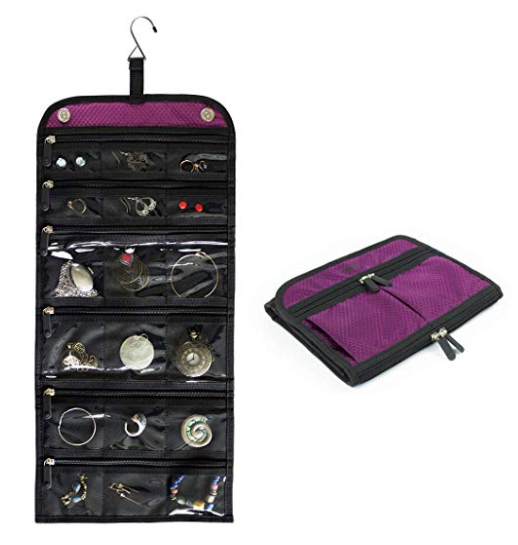 The Magnetic Latch Trifold design folds up compact, and makes it convenient to take your jewelry collection with you on all of life's adventures. 💍 HIGHEST QUALITY - Jaimie is the Highest Quality Jewelry Holder your hard earned money can buy. The heavy duty honeycomb fabric & transparent windows are similar to materials used in travel luggage, which means it's extremely STRONG & tear RESISTANT. Jaimie can support your heaviest jewelries & accessories. 💍 GET ORGANIZED - No more digging. No more searching. No more forgetting. Jaimie Hanging Jewelry Organizer gives you an INSTANT visual of your entire collection, and makes it EASY for you to decide what to wear. There is nothing better than always having the perfect accessory for that perfect outfit. 💍 MULTIPLE POCKET SIZES - Jaimie Travel Jewelry Organizer has pockets of varying sizes, so you can fit all of your accessories, big or small. Use it for rings, necklaces, bracelets, watches, headbands, earrings, rings, makeup, and more. Pockets line both the front and back of the Jewelry Organizer to maximize storage. 💍 PROTECT & SECURE - Jaimie Jewelry Organizer PROTECTS your treasured accessories from scratches or nicks. The durable zippers SECURE your investments and prevent them from falling out, regardless of whether you are at home or on the road. Use 10% off promo code JMLOVE10 valid until February 28th, 2019. (Organize Your Jewelry for Travel Easily with Jaimie Jewelry Organizer) These organizer are so nice to have. I have a bigger one on the back of my closet door to keep all of my jewelry in. These are nice for small craft items too. It helps to keep them handy, organized and easy to see since it is clear vinyl pockets. yes definitely! Especially for beading and things like that.